…..what a voice Karen Carpenter had! …..not great for taking pictures. ………..I have not been very successful in doing this. My bookcase in the great room is backed by cherry beadboard. ……….so that the bookcase would have a lighter look. 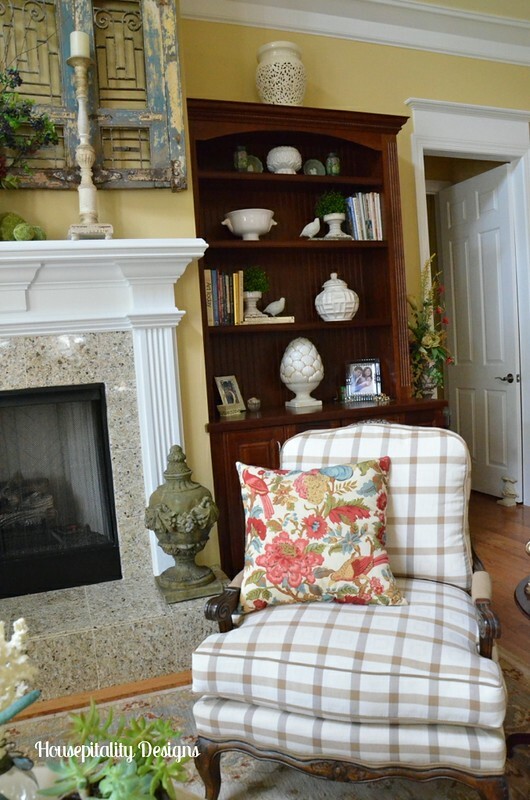 The white decorative items are from places such as Pottery Barn and Carolina Pottery. 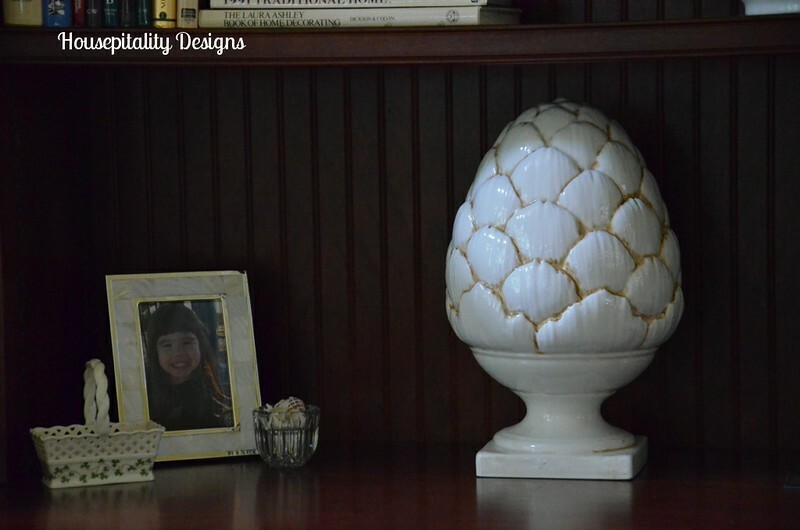 This large “artichoke” finial was downstairs…my Ethan Allen bargain. It goes well with the colors in the new chair. …..as I love to see my favorite photos of my family and friends. 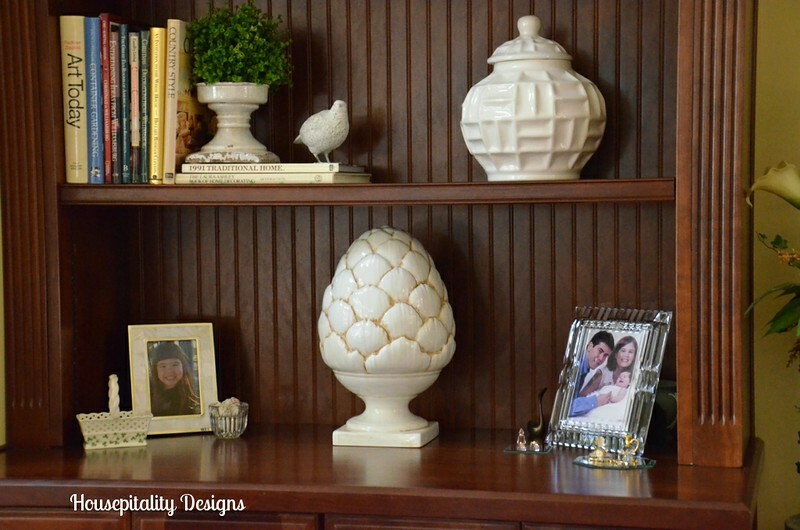 These “birds of a feather” appear throughout the house in many vignettes. So here is “one-half” of the bookcase “re-design”….still tweaking the other side! And getting back to the “rainy days”…. What do you do on a rainy day?…. I was in the Atlanta area this past holiday weekend to celebrate my brother’s retirement..
…..it was great to get together with all my siblings and mother. Unfortunately there was not much “boat time” on his lake as it rained every day!!. But we had a great time in spite of the rain. I took part of a day to meet up with Kim…to go shopping..
Little did you know that there were lots of packages behind the chair when I was snapping pics! As you can see, we had a very productive day! Hope you had a wonderful 4th of July holiday!!! Loving your touches of white. I guess we have white and lighting things up on the brain after so much gloom. I like what you did to your bookcase. Have you thought about putting mirrors in the back? My friend did that and it really lightened up the space – just a thought. Can hardly wait to see your re-do’s. Spoke to my cousin this am in Buchanan, VA and she said all it does is rain and are expecting more tonight. The only shoes she wears are her high rubber boots. She lives on a farm. 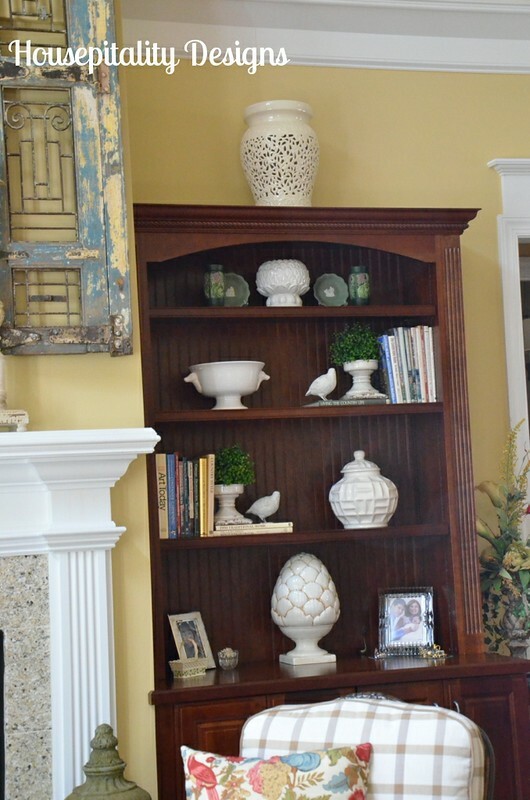 I enjoyed the lighter bookcase, and was wondering if those vases were Roseville or Rookwood. They add depth to all the other white items, please don’t remove them. But I’m more nosey about what is in all your shopping bags!!! That looks like fun. 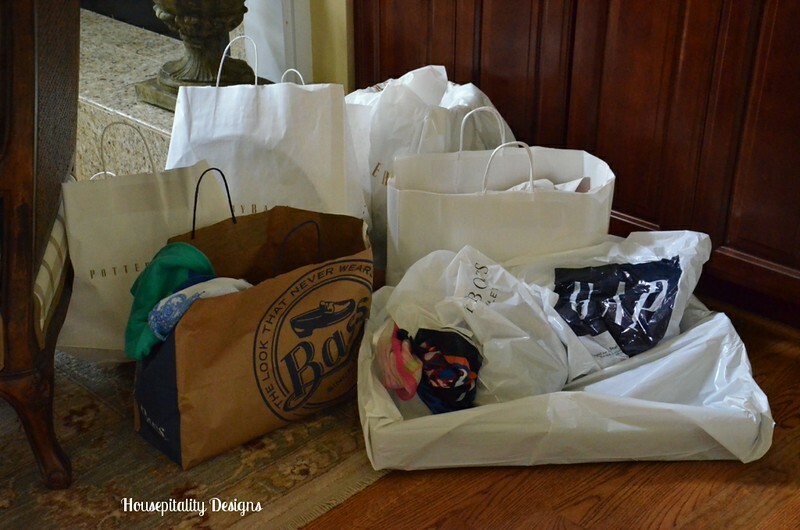 In the bags?….lots of Pottery Barn pottery and “tidbits” and clothes!!! Great bargains!! Everything looks beautiful, love that artichoke finial from PB. Can’t wait to see what else you got I noticed some more PB bags!! someday i’d like to see where you keep it all! you have an amazingly impressive stash somewhere ;-). 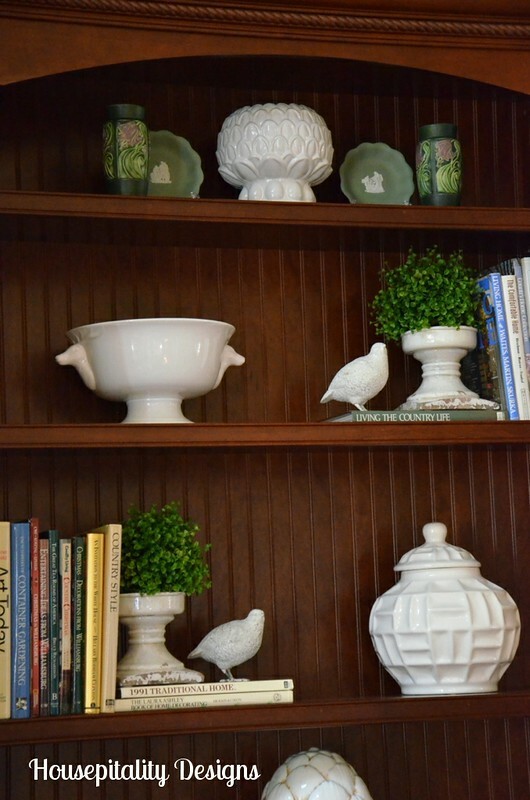 really like all the white, especially the way you staged the 2 birds on different shelves. very harmoniuos. Sorry I missed u this trip! How beautiful! I love your shelves and how you’ve decorated them. It’s always a little hard for me trying to get shelves right. Yours look gorgeous. Bookcase shelves look really nice. I like how you have simplified them. I must ask though…no shoe shopping? You needed me along on your shopping spree! I’ve decided you are the ultimate shopper as you always have one eye open for that special buy. You usually fine it, too! Savannah Granny’s recent post…A CELEBRATION OF FREEDOM! PS, Karten Carpenter had the MOST beautiful voice!!!!!!!!!!!!!! 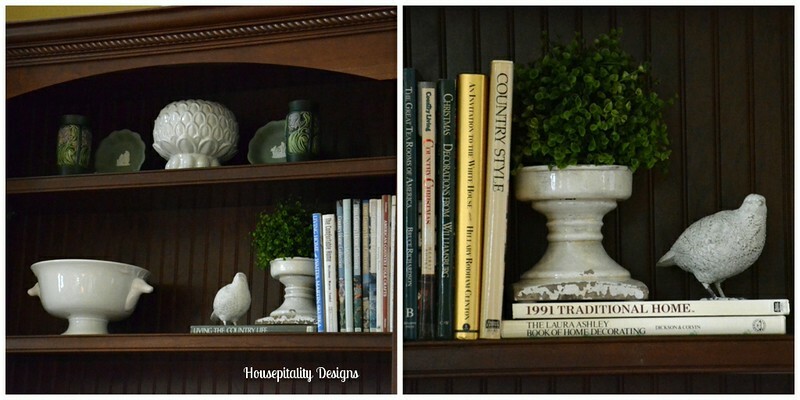 Love your white accents in your bookcase Shirley! I was beyond THRILLED to see the sun put in an appearance yesterday and Sunday! More rain on the way starting tomorrow, joy, joy. Mary’s recent post…Corn and Bacon Guacam-Olé! Hi Shirley. I’m playing catch-up again. We’ve had a lot of rain, too. Glad to see you and Kim got to go shopping together. I’m looking forward to Haven and seeing you guys. 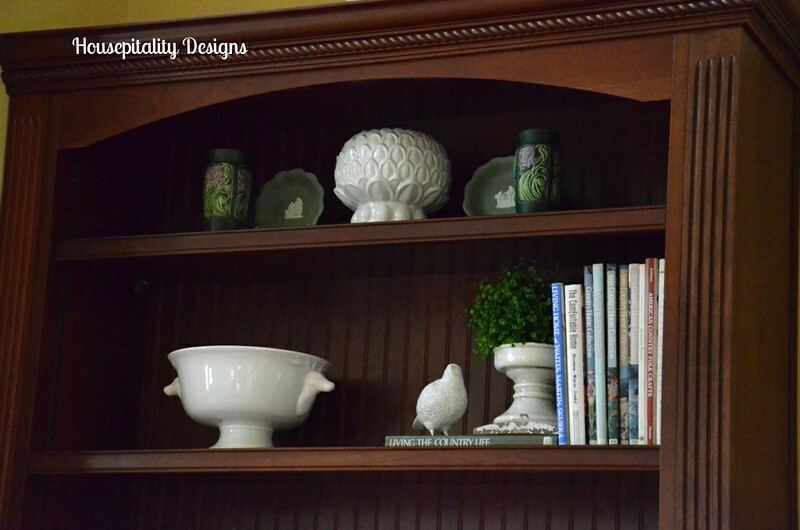 Love the bookcases and can hardly wait to see all of the tweaks!! 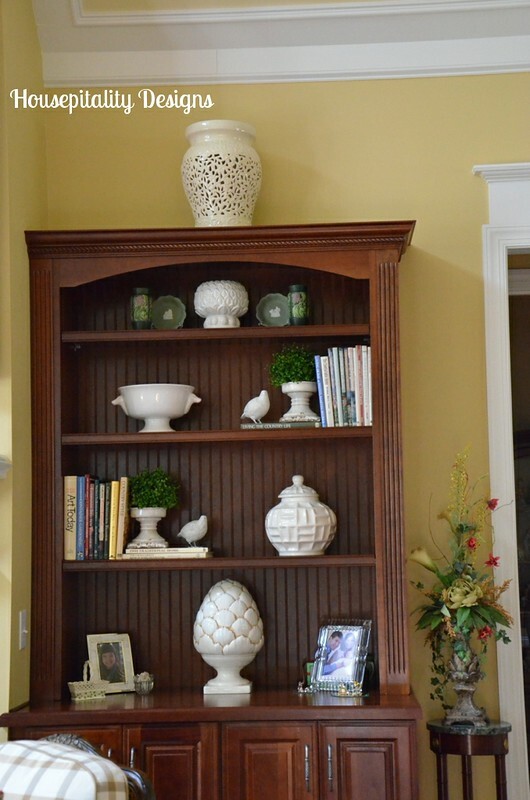 Shirley, the white accents look great against the dark finish of the bookcase. So pretty! Glad you had fun shopping with Kim! Hi, Shirley! I don’t follow the “no personal photos” rule either. Makes you wonder if the person who first came up with that didn’t have children! 🙂 I need to update my home tour as well but haven’t been able to get around to it. Love how you’re lightening the bookcases. Lovely!